4s is fastest phone out threre. Apple's ability to control the entire information chain, down to the point of limiting leaks, appears to be gradually slipping as it grows as a company. 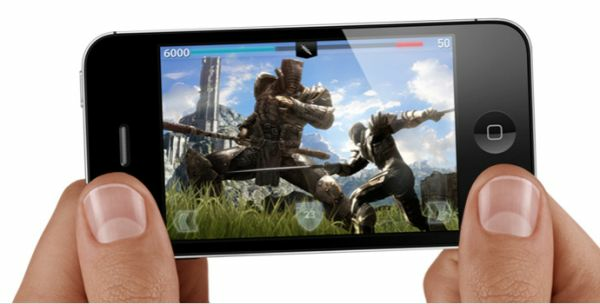 Case in point are the numerous hardware and performance leaks surrounding the newly launched iPhone 4S. Little did we know that several weeks ago we were staring at photos of the 4S' PCB, and more recently we've seen the first performance results from Apple's first A5 based smartphone thanks to a few eager users around the web. We've compiled these results here from various sources (all linked below) and compared them to our existing database of tests. Keep in mind that all of these tests measure performance of the software stack in addition to the hardware. In particular the web browser tests depend largely on browser optimizations, which is why we see differences between similar hardware running different browser versions. Also note that all results were run at stock, with the stock browser. Finally, although these browser tests were captured on video we'll still be running our official tests once our 4Ses arrive and will update accordingly. 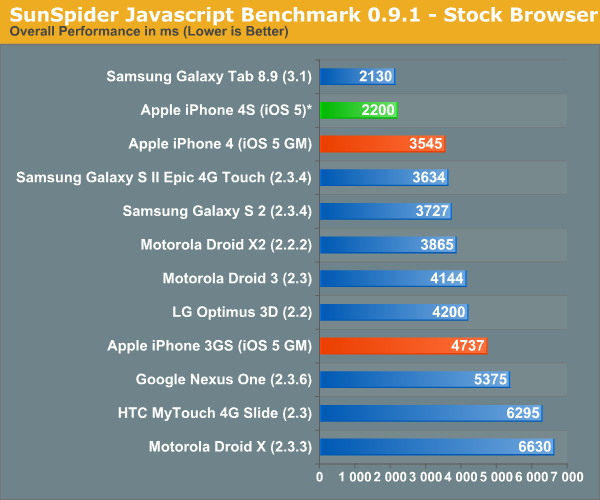 Update: We made a mistake in our original presentation of the SunSpider numbers and compared the iPhone 4S' 0.9.1 results to our existing database of 0.9.0 scores. We have since updated the graph to compare directly to our 0.9.1 numbers. The rest of the results are unaffected. I apologize for the confusion. The distribution is a lot tighter than before, however the relative standings don't really change. I still fully expect ICS to narrow a lot of this gap between iOS and Android devices - if we look at the lone Honeycomb result you get an indication of that. Note that we always run our benchmarks on a stock OS/browser configuration.